ABSTRACT: Land use change continues to be a major driver of biodiversity loss worldwide. Remote sensing is increasingly being used to monitor changes in forest cover, species distributions and carbon stocks. However, commercially available remote sensors and remotely sensed data can be prohibitively costly and inaccessible for researchers in many developing countries. In 2012, I co-founded a non-profit — ConservationDrones.org — to share my experience of using scratch-built, low-cost and autonomous unmanned aerial vehicles for monitoring orangutan populations in the rainforests of Sumatra, Indonesia. Since then, my team and I have travelled to over a dozen countries around the world to introduce this technology to our colleagues in the conservation community. I will talk about the various applications of conservation drones for ecological and conservation research. BIO: Lian Pin received his doctorate in Ecology and Evolutionary Biology from Princeton University (2008). He moved to Switzerland in 2008 and underwent post-doctoral training at the Swiss Federal Institute of Technology (ETH Zurich). In 2011, he was appointed a Swiss National Science Foundation Assistant Professor. In 2014, he moved to Australia, and since then has been Associate Professor and Chair of Applied Ecology & Conservation at the University of Adelaide. 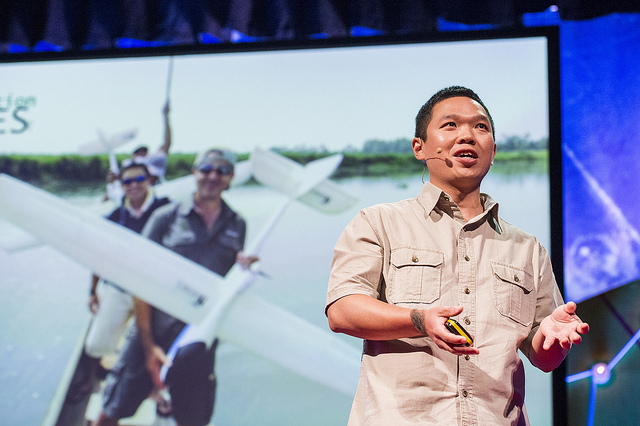 Lian Pin currently is also Indo-Pacific, Australasia Editor for Biological Conservation, the Regional Technical Advisor for the Asia-Pacific Field Division of Conservation International, a recent TED speaker, and a Founding Director of a non-profit, ConservationDrones.org. In 2014, he was awarded an Australian Research Council Future Fellowship (Level II). Lian Pin’s research focuses on addressing emerging environmental and socioeconomic challenges facing tropical developing nations including intensifying land-use conflicts, carbon emissions from land-use change and forestry, and threats to natural ecosystems and wildlife. He employs a variety of scientific approaches including field surveys and experiments, and developing theoretical and computer simulation models. He also develops and implements innovative approaches to collect data, and disseminate science and science-based decision-support tools to land use decision-makers. For enquiries and appointments with the guest speaker, please email Euan Ritchie or Daniel Ierodiaconou.